Pest monitoring Check plants frequently after transplant or seedling emergence. 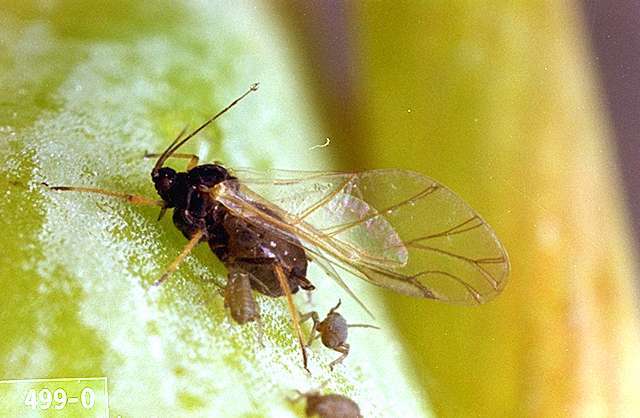 Aphid often are concentrated in "hot spots." Be sure to look for evidence of biological control; i.e., the presence of predators, parasites (aphid mummies), and disease. 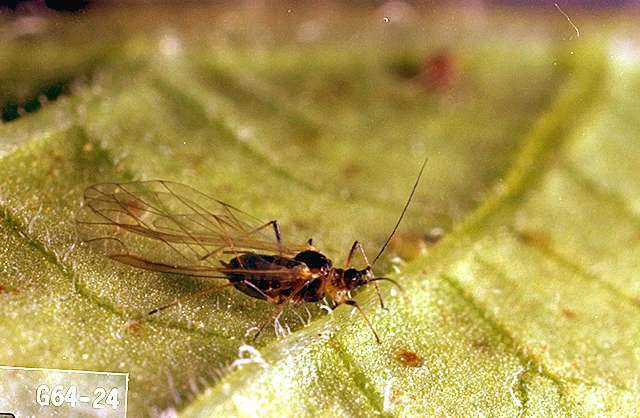 Aphid flights are most common during periods of moderate temperatures (60° to 80°F). Monitor plants particularly closely during April and May. 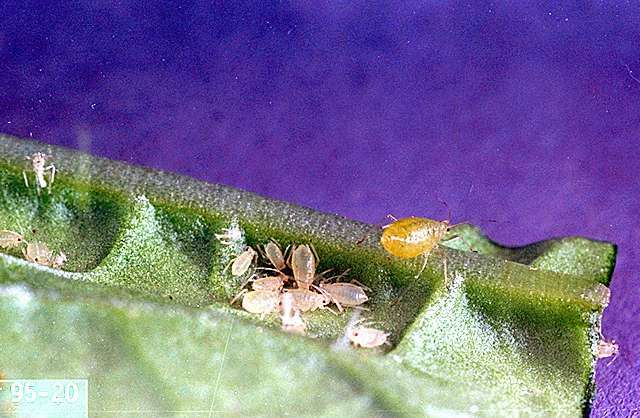 Many parasites and predators attack aphid. Monitor the proportion of aphid mummies to unparasitized adults and the number of predators such as lady beetles. If the biocontrol agents appear to be gaining control, avoid sprays which would disrupt this system. Most products available for aphid control are highly disruptive of natural enemy populations. 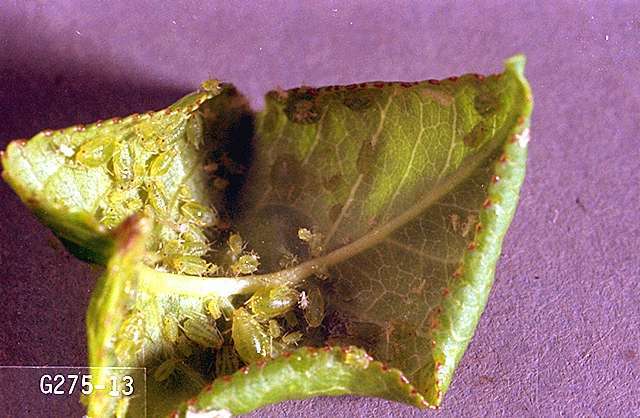 Aphid populations tend to be higher in plants that are fertilized liberally with nitrogen. Home gardeners can use row covers or wash aphids from plants with a strong stream of water. kaolin-Applied as a spray to foliage, it acts as a repellent to some insect pests. Some formulations are OMRI-listed for organic use. spinosad-Some formulations OMRI-listed for organic use. acetamiprid (Assail 30SG) at 0.038 to 0.075 lb ai/a. PHI 7 days. REI 12 hr. Retreatment interval 7 days. Do not exceed four applications or 0.3 lb ai/a per season. alpha-cypermethrin (Fastac EC) at 0.02 to 0.025 lb ai/a. PHI 1 day. REI 12 hr. Retreatment interval 7 days. Do not exceed 0.075 lb ai/a per season. azadirachtin (Neemix)-See label for rates. Acts slowly. Apply early. PHI 0 days. REI 4 hr. Thorough coverage and repeat applications are necessary. beta-cyfluthrin (Baythroid XL) at 0.013 to 0.022 lb ai/a. PHI 7 days. REI 12 hr. Retreatment interval 7 days. Do not exceed 0.132 lb ai/a per season. beta-cyfluthrin/imidacloprid (Leverage 360) at 0.089 to 0.096 lb ai/a. PHI 7 days. REI 12 hr. Retreatment interval 7 days. Do not exceed 0.12 lb ai/a beta-cyfluthrin or 0.24 lb ai/a imidacloprid per season. bifenthrin/avermectin (Athena) at 0.05 to 0.12 lb ai/a. PHI 7 days. REI 12 hr. Retreatment interval 10 days. Do not exceed 0.056 lb ai/a avermectin or 0.4 lb ai/a bifenthrin per season. bifenthrin/imidacloprid (Brigadier) at 0.06 to 0.15 lb ai/a. PHI 7 days. REI 12 hr. Do not exceed 0.24 lb ai/a imidacloprid and 0.2 lb ai/a bifenthrin. Retreatment interval 7 days. borate complex (Prev-Am Ultra) applied as a 0.8% solution. REI 12 hr. Apply to complete coverage. REI 12 hr. Retreatment interval 7-10 days. OMRI-listed for organic use. chlorantraniliprole/thiamethoxam (Voliam Flexi) at 0.1 to 0.175 lb ai/a. PHI 1 day. REI 12 hr. Retreatment interval 5 days. Do not exceed 0.172 lb ai of thiamethoxam or 0.2 lb ai of chlorantraniliprole per acre per growing season. cyfluthrin (Tombstone) at 0.025 to 0.044 lb ai/a. PHI 7 days. REI 12 hr. Retreatment interval 7 days. Do not exceed 0.263 lb ai/a per season. cyfluthrin/imidacloprid (Leverage 2.7) at 0.08 to 0.11 lb ai/a. PHI 7 days. REI 12 hr. Retreatment interval 7 days. Do not exceed 0.17 lb ai/a cyfluthrin or 0.24 lb ai/a imidacloprid per year. deltamethrin (Delta Gold) at 0.018 to 0.028 lb ai/a. PHI 1 day. REI 12 hr. Retreatment interval 5 days. Don not exceed 0.168 lb ai/a per year. dinotefuran (Scorpion 35SL) at 0.05 to 0.18 lb ai/a foliar or 0.23 to 0.27 lb ai/a for soil. PHI 1 day foliar, 21 days for soil. REI 12 hr. Do not exceed 0.266 lb ai/a foliar or 0.532 lb ai/a per season for soil. flonicamid (Beleaf 50SG) at 0.089 to 0.133 lb ai/a. PHI 0 days. REI 12 hr. Do not exceed 0.267 lb ai/a per season. Limit 2 treatments at high rate and 3 treatments at low rate. Retreatment interval 7 days. flupyradifurone (Sivanto 200SL) at 0.09 to 0.16 lb ai/a foliar; 0.27 to 0.37 lb ai/a soil. PHI 1 day foliar; 45 days soil. REI 4 hr. Retreatment interval 7 days. Do not exceed 0.365 lb ai/a per season. imidacloprid (Admire Pro) at 0.25 to 0.38 lb ai/a soil, 0.0156 lb ai/10,000 plant in greenhouse and 0.047 to 0.079 lb ai/a foliar. PHI 0 days foliar; 21 days soil. REI 12 hr. Do not exceed 0.24 lb ai/a foliar or 0.38 lb ai/a soil per season. Limit 1 greenhouse application. Foliar retreatment interval 5 days. imidacloprid (Provado, Prey) at 0.048 lb ai/a. PHI 0 days. REI 12 hr. Allow 5 days between foliar sprays. Do not exceed 0.24 lb ai/a per season. lambda-cyhalothrin/thiamethoxam (Endigo ZC) at 0.064 to 0.072 lb ai/a. PHI 5 days. REI 24 hr. Retreatment interval 5 days. Do not exceed 0.36 lb ai/a of lambda-cyhalothrin or 0.172 lb ai/a of thiamethoxam per season. malathion (Malathion 8) at 1.56 lb ai/a. PHI 3 days. REI 12 hr. Limit 4 applications. Retreatment interval 5 days. methomyl (Lannate SP) at 0.225 to 0.9 lb ai/a. PHI 5 days. REI 48 hr. Do not exceed 4.5 lb ai/a per season. Limit 10 treatments per crop. naled (Dibrom 8E) at 0.94 to 1.88 lb ai/a. PHI 1 day. REI 48 hr. Retreatment interval 7 days. Limit 5 treatment per season. Do not exceed 5.64 lb ai/a per season. oxamyl (Vydate L) at 0.5 to 1 lb ai/a foliar. PHI 1 day. REI 48 hr. Do not exceed 6 lb ai/a per season. Retreatment interval 7 days. thiamethoxam (Actara) at 0.031 to 0.047 lb ai/a. PHI 0 days. REI 12 hr. Retreatment interval 5 days. Do not exceed 0.172 lb ai/a per season. thiamethoxam/chlorantraniliprole (Durivo) at 0.195 to 0.257 lb ai/a. PHI 30 days. REI 12 hr. Do not exceed 0.172 lb ai of thiamethoxam or 0.2 lb ai of chlorantraniliprole per acre per growing season. zeta-cypermethrin (Mustang) at 0.04 to 0.05 lb ai/a. PHI 1 day. REI 12 hr. Retreatment interval 7 days. Do not exceed 0.3 lb ai/a per season.